But moving on to bigger things… N&J has a great menu, with lots to choose from. I think most people can find something they like. I tend to stick mostly to sandwiches for no reason other than I love pita bread. My only complaint with said sandwiches is you can’t substitute sides, even for an extra charge. The wraps come with your choice of two sides (for $2), including hummus, tabouli and baba ghanouj. This is great. But if I want hummus and a fattoush salad, I pay for the sides and end up with a double-side of hummus (since I don’t care for the other sides, they give you double if you only pick one), and then tack on the cost for a side salad. I’m sure they get this complaint all the time since fattoush salad is offered as a fairly standard side in most Mediterranean restaurants. And I’m sure there’s a financial reason they don’t offer this option. But just for kicks I think there’s a simple solution… For example, you could get two of the given “standard” sides for $2. Or you could choose to upgrade to a “premium” side for $1 extra (making it $3 for hummus and fattoush). Hey, I’d pay it. And I’m sure they have the salad sitting back there, just begging to be eaten! OK, back to our menu selections. I was lucky enough to have two great dinner dates! Lynds got their Combo. She’s a sucker for snack foods, so don’t be alarmed. The Combo consists of hummus, baba ghanouj, tabouli, grape leaves, cabbage rolls, kebbe and falafel. After asking for the advice of our waitress (who we were impressed with, by the way), Alexis ended up choosing the Gyro with a side of hummus and tabouli. I got the Kafka sandwich with a double side of hummus. All-in-all we were pleased with our selections. Alexis wasn’t a fan of the tabouli. She thought it had too much parsley. But her sandwich was delicious. Lynds was mostly happy with her selection. She was scared of the cabbage rolls, but liked everything else, except she definitely leaned toward the hummus over baba ghanouj. We were all big fans of the hummus, in fact. And I’d give my Kafka a solid B. Yes, folks, after all of that we even had dessert. And we didn’t feel guilty at all about it. Lynds got the baklava she’d been craving for weeks. Alexis got an almond cookie. And I splurged on Snickers cheesecake. Lynds said her dessert was “pretty good.” But Alexis and I were more than pleased with our selections. And I’m not even a chocolate fan. The cheesecake hit the spot, and I ended up eating way more than I should have. They’re open Monday-Saturday for lunch and dinner. Don’t forget to check out the small store attached to the restaurant. I like to take fresh baked pita home with me! Bottom line: I wish their sandwich sides were more flexible. But overall the food is very good. They have an educated wait staff who understands how the dishes are made and can make good suggestions. Hummus is A+. 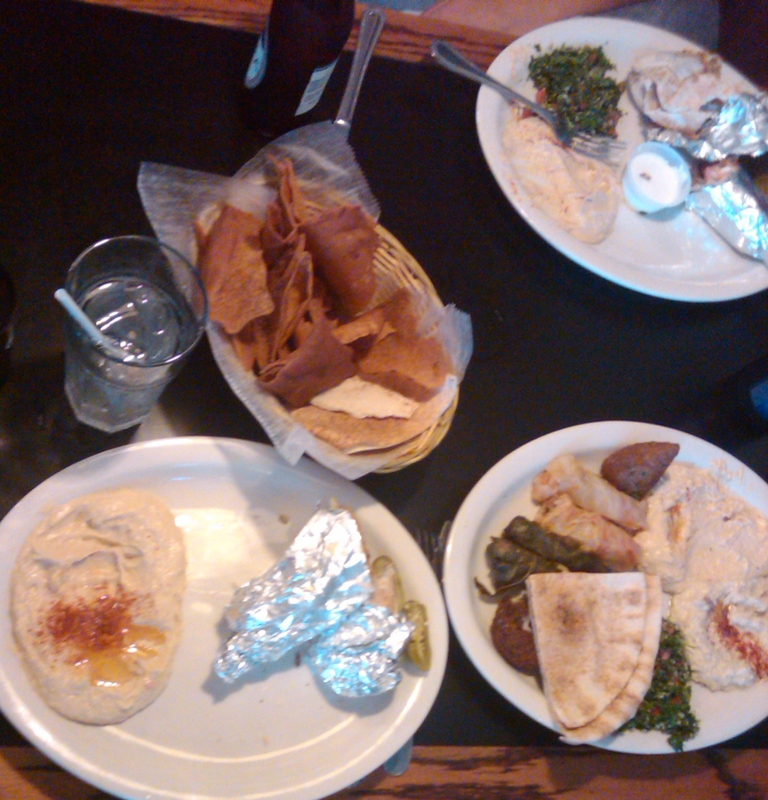 Starting in the lower left and rotating clockwise: My kafka sandwich and double side of hummus, our pita basket, Alexis’ gyro with hummus and tabouli, and Lynds’ combo plate. AND if anyone is looking for the best Baklava in town, you can get it at St. Mary’s Orthodox church’s Mediterranean Festival. It happens in May and they have lots of other yum food there too. U have to check out KABA’S (?) iTS ON tYLER/13TH STREET. Kababs? I heard that place is good! Hopefully soon I’ll be a west-sider and can really dig into some of their great restaurants. Trying to soak up the last bit of east Wichita while I can!